I have been looking for one of these for so long, thank you for posting it! It's so useful! This is helpful for me to create OCs. Question, Will you end up doing the same thing for eye colors? That would really help! the main thing is, to make it as useful as possible, I want to create some kind of utility that lets people layer different eyes and change opacities to get just the colour they were thinking of. I just don't know how to do that. Which one would be considered 'chestnut' color hair? I always get confused. wiki describes it as "brownish blonde shade of brown hair"
Hi I am a hairstylist. 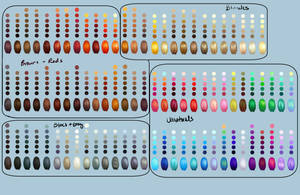 Can I use this color chart for business? It's great! Sure, just make sure I'm credited. Wow! This is really cool! You, are an awesome person. This will be super useful! Thank you for posting this! This is super useful, thanks a ton! I can never tell what would actually be natural and what wouldn't, and this gives me an idea range of what's pretty acceptable! Thanks again! This is perfect! Thank you for making this!! Well, this is going in my "reference materials" folder. I love you SO hard right now! hello there, i just wanted to ask before using this, but it is fine with you if i may use these for some drawings? You might want to look up "Creative Commons"
uwu; if its not too much to ask of may i please use this? i know it takes time and practice but i'll get better! ! ! Thank goodness I saw this linked in my Tumblr dashboard. References like this help so much when it comes to pixelart. Wow, shows how much I know about hair coloration. There's a couple of the "red" that I would've called "blonde," and vice versa. Oh, wow. This is fascinating!